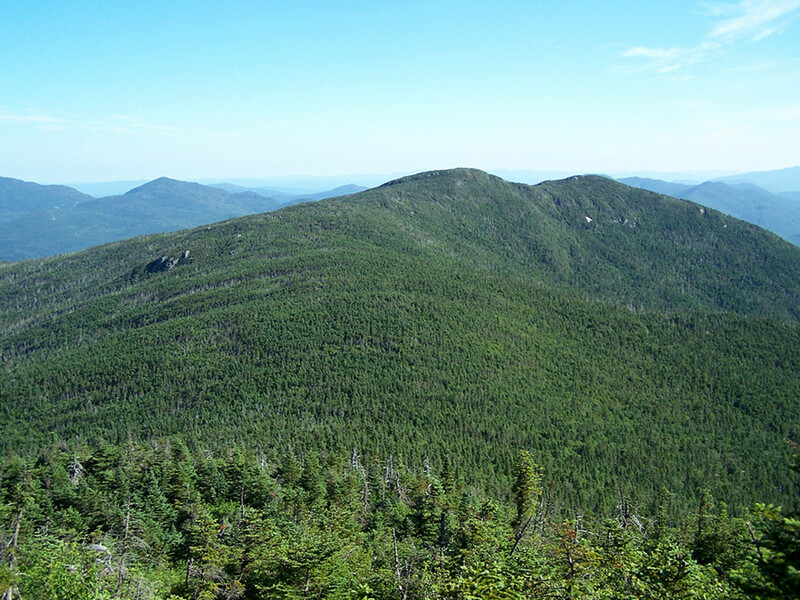 Cascade Mountain and it's neighbor Porter are, according to McMartin and Ingersoll the most accessible of all the High Peaks and "probably easiest to climb." 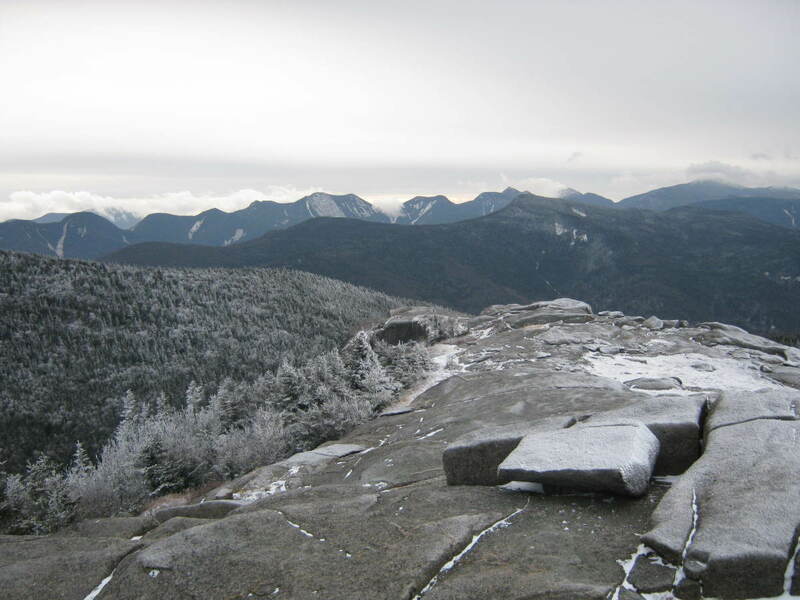 The exposed summit of the 4098' Cascade has one of the best views in the Adirondacks. The last time I climbed Cascade and Porter in June a few years back, the worn trail was full of people negotiating the mud and rocks and the summit was alive with the chatter of many excited people who had just climbed their first mountain. In my most recent ascent, on December 2nd, with snow flurries in the air and ice beneath my feet it was much more solitary. Especially because I took a new undesignated route up the mountain. 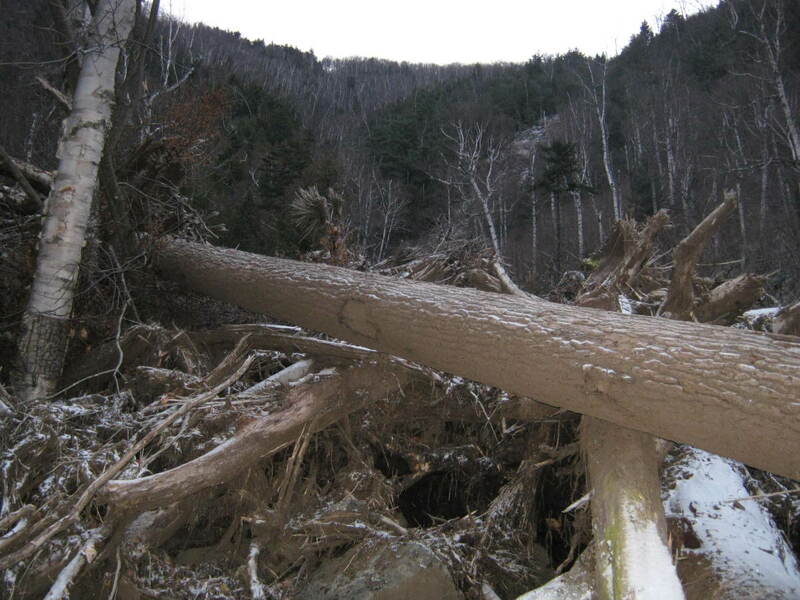 As Tropical Storm Irene pummeled the High Peaks in late August , the topography of the Adirondacks changed as fierce rains washed down the steep slopes of the mountains. Trees rooted in thin soil along once small drainages were swept to the valleys and gave rise to new slides with large expanses of bare rock. 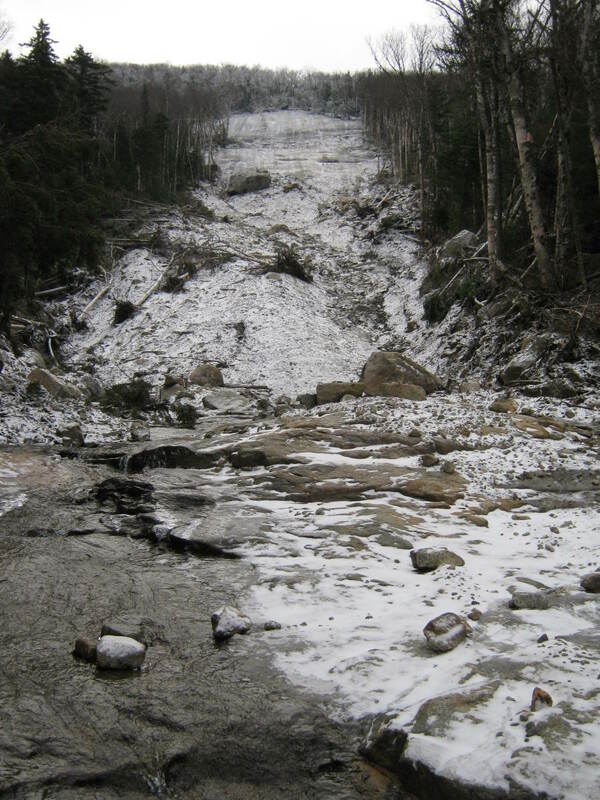 The small stream that feeds the waterfalls on the northwestern slope of Cascade Mountain was overwhelmed with the force of water and expanded into a new scar on the mountain. 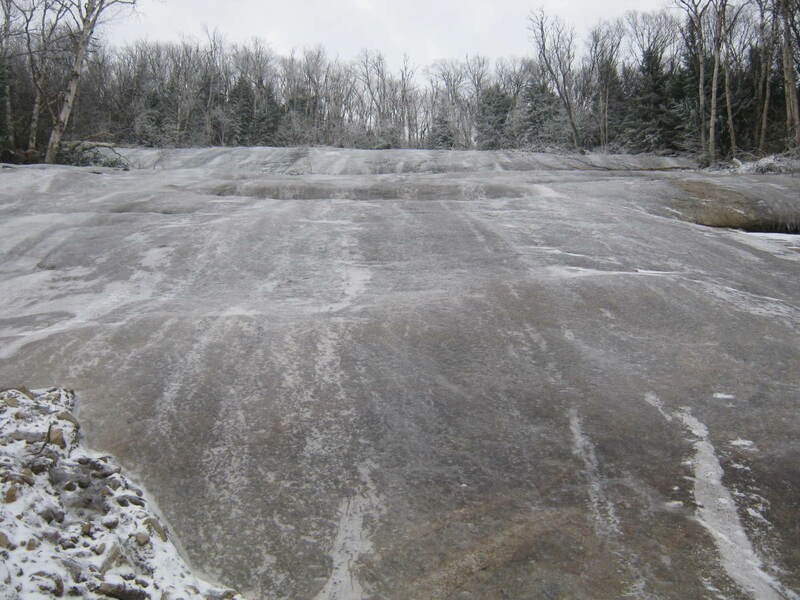 This new slide, the "Snow Princess" Slide, offers an exciting new way to climb this extremely popular mountain. 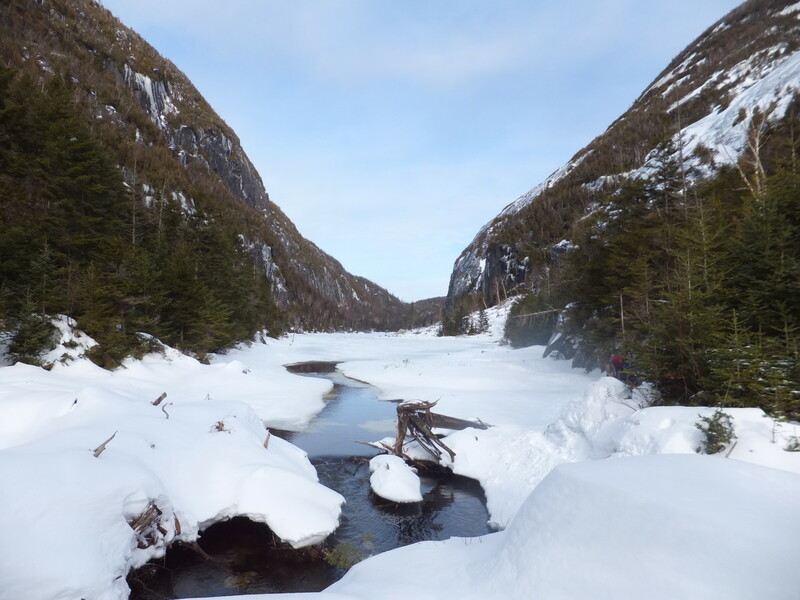 Though you could park near the very busy Cascade Mountain trailhead, drive about.8 miles toward Keene Valley to the small picnic area between Upper and Lower Cascade Lakes. There is ample parking, a few picnic tables, and an outhouse. Proceed over the wooden bridge at the southern end of the parking area, and follow the very clear herd path that parallels the creek. I continued on the well worn herd path along the creek uphill toward the showering cascade. 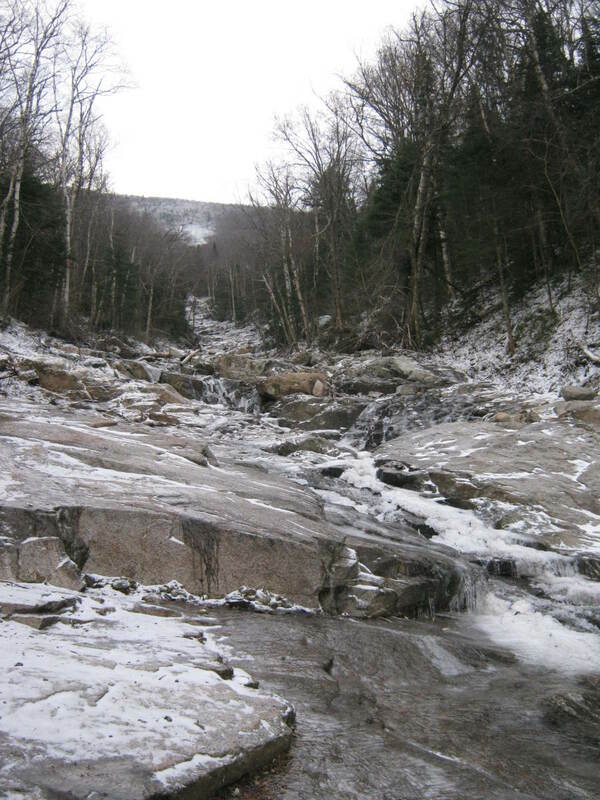 Ice covered the rocks and made them slippery, like bowling balls greased in crisco. I stopped and attached my Kahtoola Microspikes to my keen boots for much needed traction. 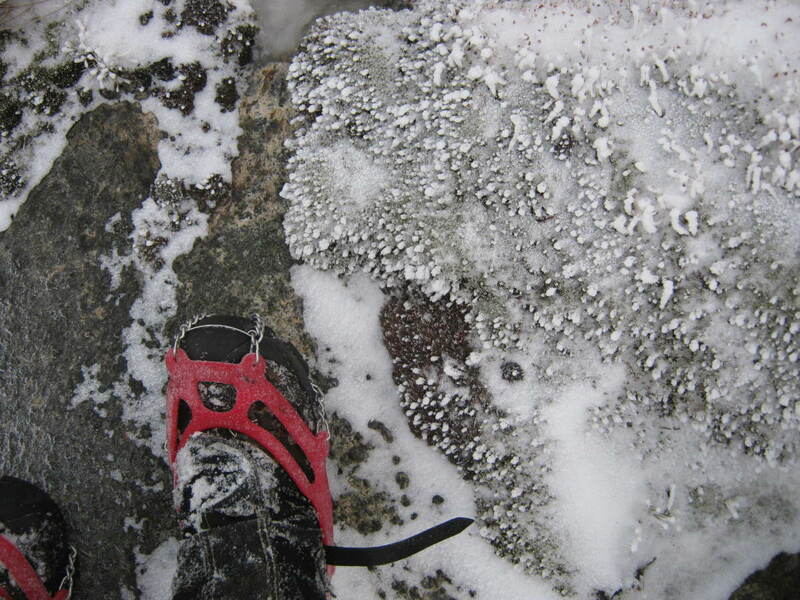 Microspikes are ideal in mixed conditions with rock, ice, and mud. Plus they are easier to walk in on thinner ice than a full crampon. In preparation for the steep climbing ahead, I left my trekking poles in the car - on this trip they would have been a greater burden than a help. This was the first High Peak I've climbed without trekking poles since 1997 when I bike toured the area - it was strange to be without them. I kept my pack light, carrying the Outdoor Essentials to make sure my climb was safe as it could be. I knew if I fell, I may lay there for a couple days until help came, so I was as prepared to stay the night if need be. I was glad my pack was light as I began pulling myself over the rocks and the jumble of trees washed down the mountain from the storm. 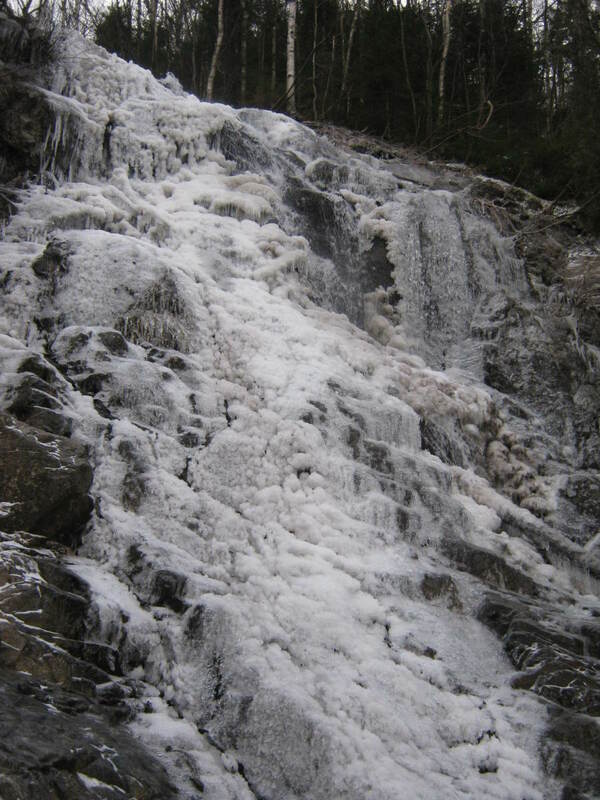 Soon I reached the waterfalls splashpool with a fair volume of water and ice cascading into it. Taking Bill Ingersoll's advice, I skirted to the left of the steep rock into the woods where I found a lightly used herd path. I jumped in between the woodline and the rock face frequently, changing to afford the most energy efficient, scenic, and environmentally conscious route available. 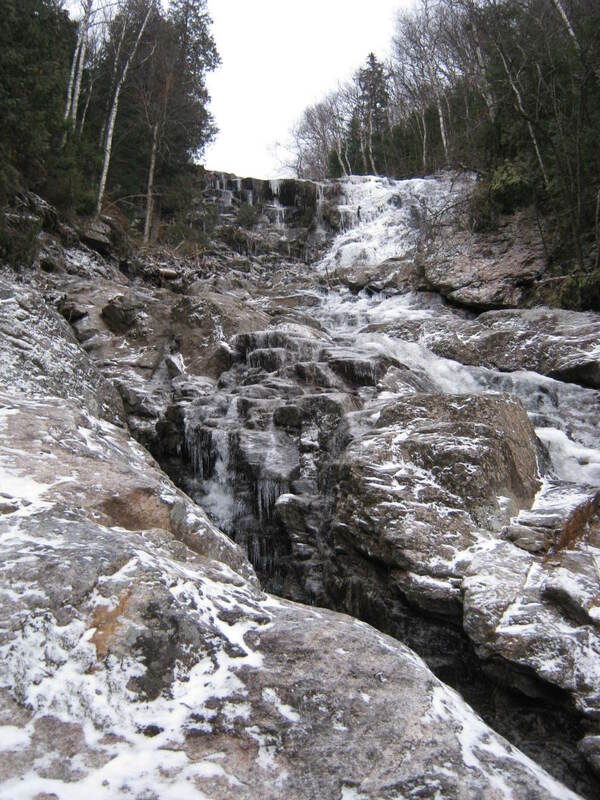 Above the waterfall, where the slide starts the grade varies and requires good balance and a few skills in rock slide traversal. Remember to keep an eye ahead to look for future obstacles so you don't have to cross the slide several times. Take special care for parts of the slide still covered in dirt. If stepped upon, this dirt can easily dislodge itself and you can take a dangerous slide of your own. Also, given time and care, this soil may eventually grow new plant life. As with all things, please tread lightly and preserve the wilderness so others have a chance to enjoy it. After carefully climbing up the snowy soil-covered slope, I reached the immense headwall - a steep smooth inclined plane of rock. There are few hand holds in the rock, and the ice didn't have the proper thickness to be safe to walk on. At this point, I took to the right through the trees, spying out onto ledges when possible. 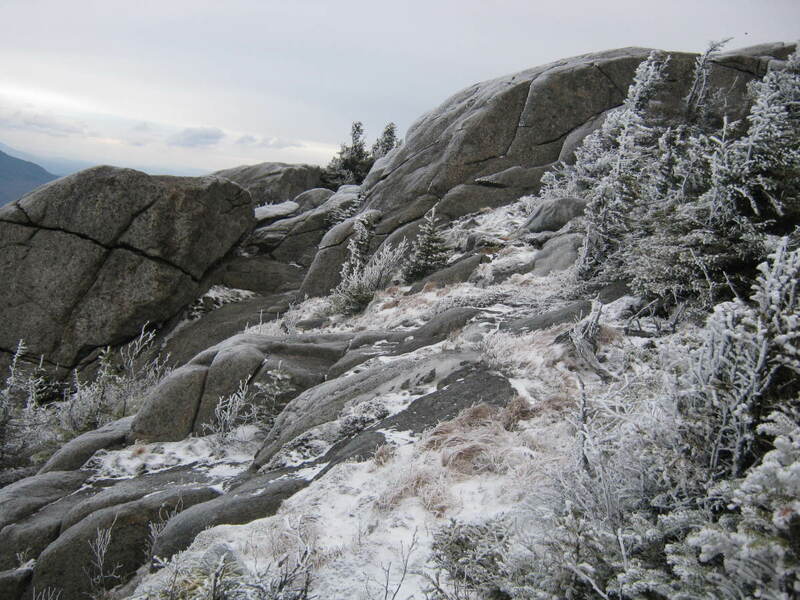 Soon, the rocky precipice disappeared and the forest grew denser as I climbed higher and higher toward the summit. As the hiker skirts around the headwall and finds themselves .3 miles from Cascade's summit, they must weave their way through the dense woods to meet the summit rock. I took the right flank around the headwall into the primarily birch woods which has a wide spacing making it easy to negotiate. I could find no discernible herd path, but kept on pushing forward and upward. Occasionally I checked my position on my GPS just to make sure I was heading the correct way. 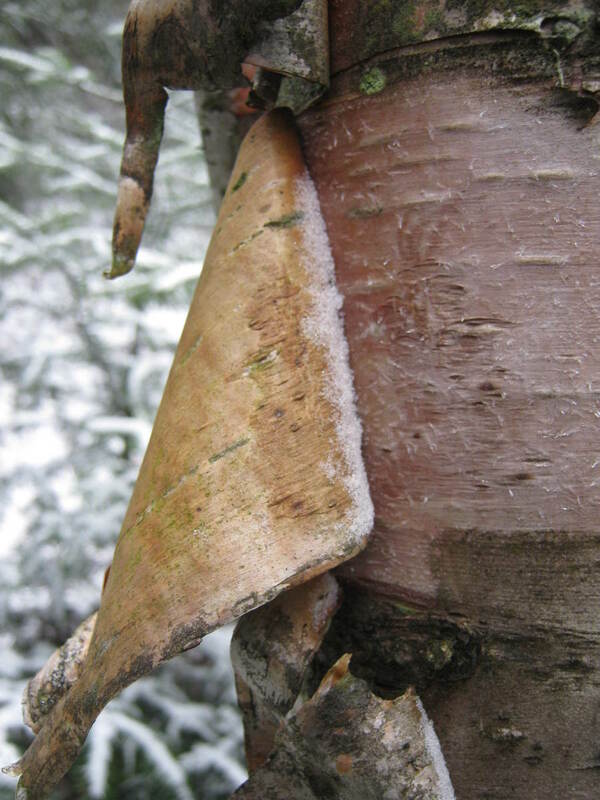 As I trudged uphill, the birch trees began to wane as the spruces began converging into a twisted mass of impenetrable conifers. I traversed laterally across the mountain searching for the path of least resistance and found myself unable to find one. I glimpsed a rock outcropping and wove my way through the branches toward it. 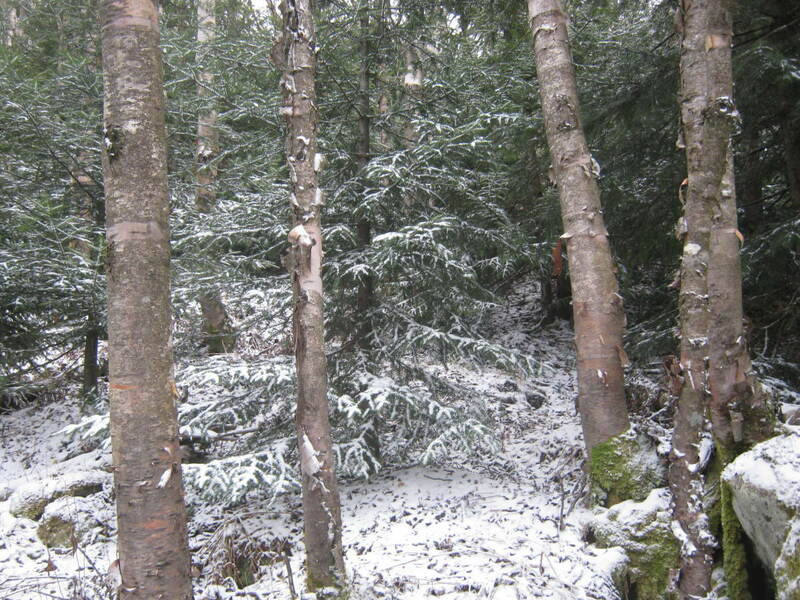 The wind howled more intensely as I picked my way carefully through the frozen trees. Finally, I reached a rock wall, flung my pack on top of it, and mantled myself up the face. I crept out on the rock portion of the northern summit and was careful not to step on the fragile arctic alpine flora that abounds in limited numbers in places like this. 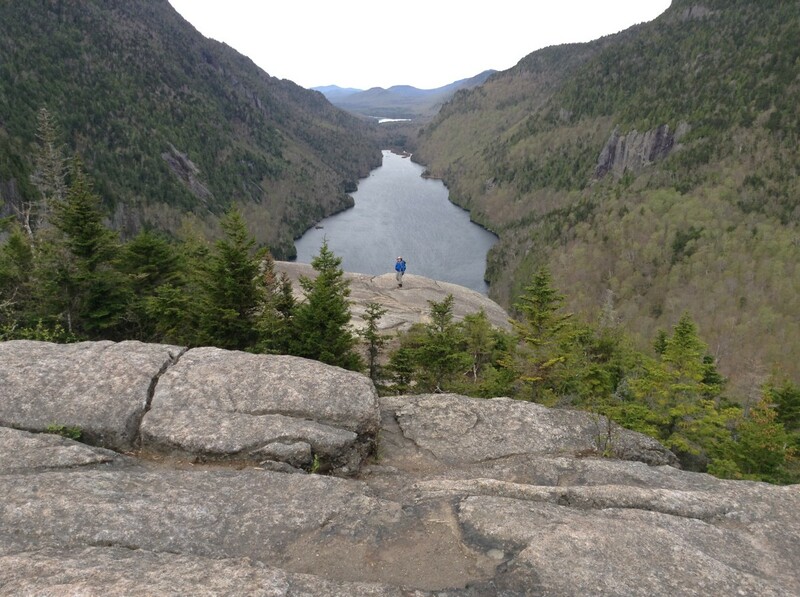 I bounded across the rocks and walked against the winds to the peak. 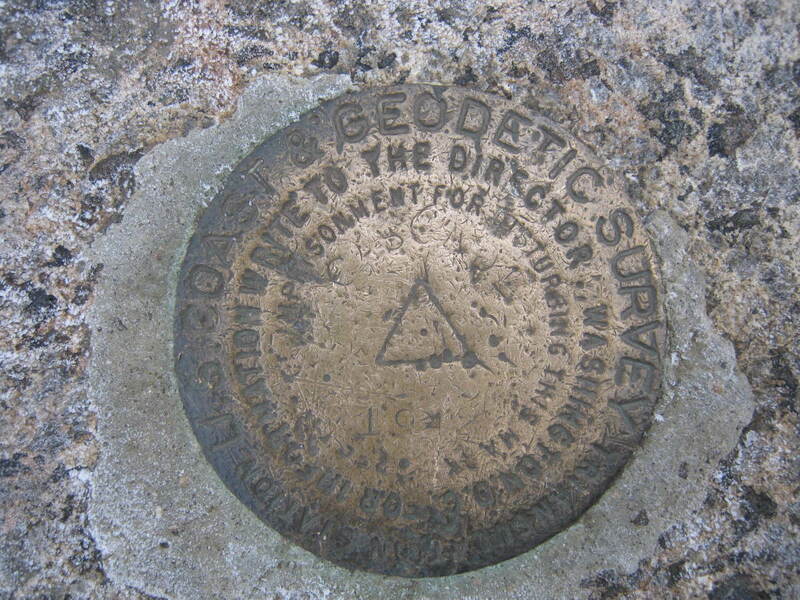 Soon I found the survey marker and took in the 360-degree view from the summit. Though I didn't "need" it except for the infamous GRID, I decided to climb Porter today too. 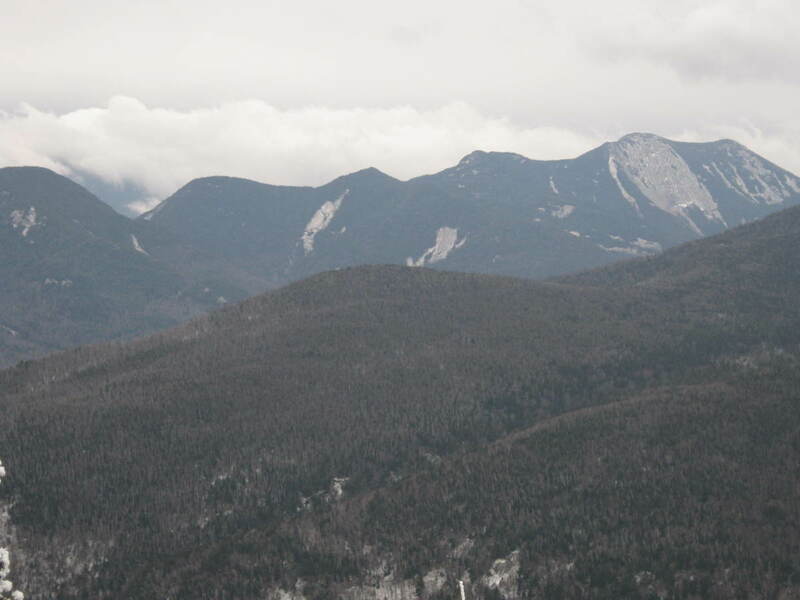 Porter has some great views, especially of the Great Range from a lookout near its summit. 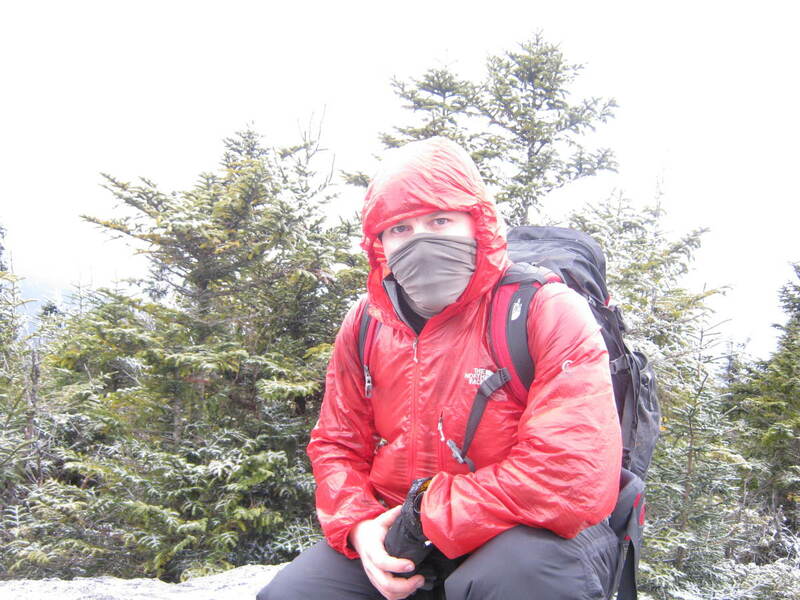 I remember the first time I did Porter it was in the clouds and I ran right over the summit and kept going. After a long descent I though, "this is the longest .7 mile ever." 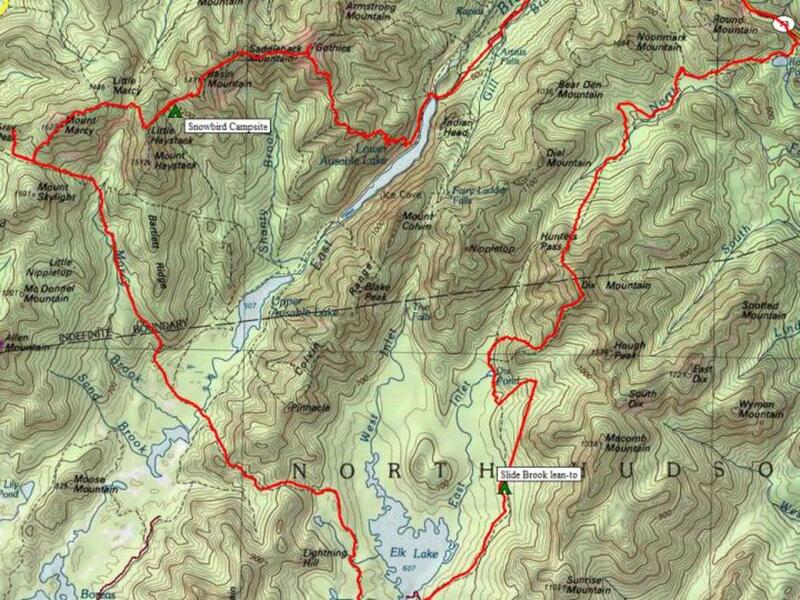 After looking at my GPS, I realized I overshot the summit by about half a mile. 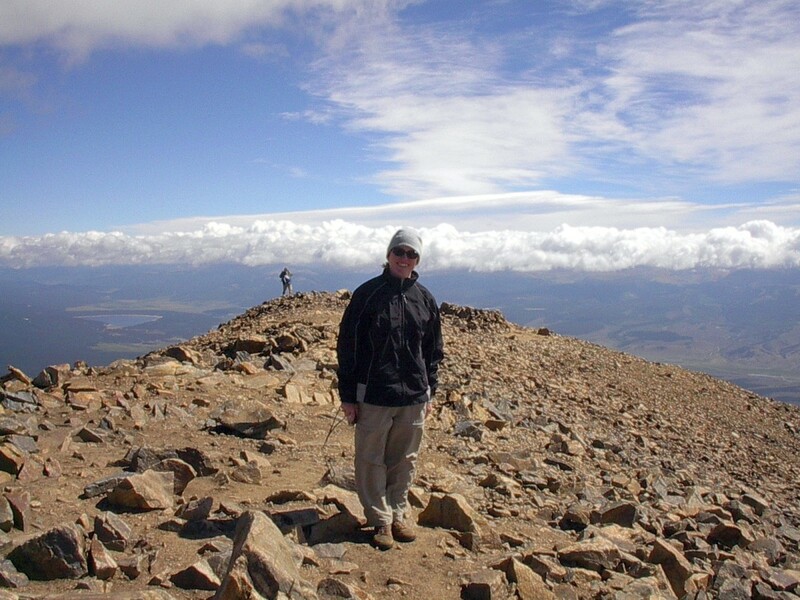 Though perhaps Porter's summit isn't as spectacular as some peaks, it is a pleasant walk with the potential for great views. The views were plenty on this day, exploring the various outlooks that surround the summit dome. 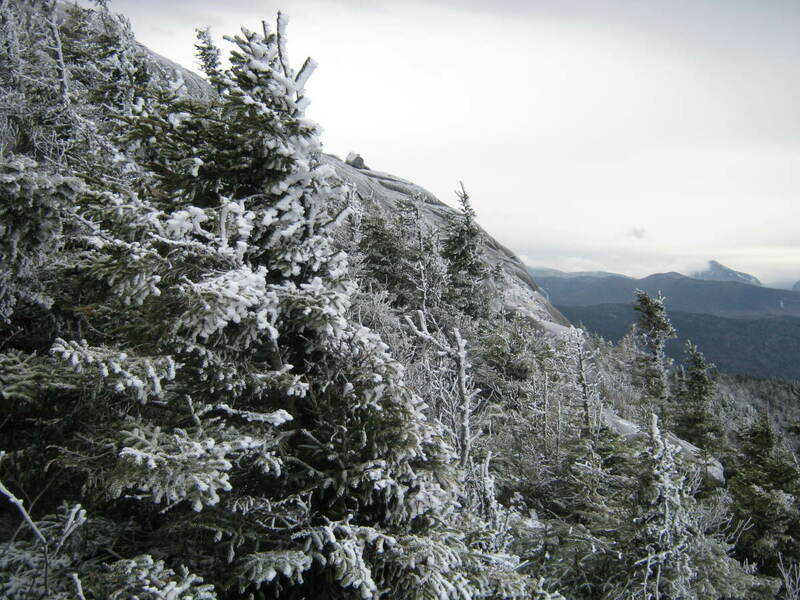 Porter is a quieter summit than Cascade, even when it isn't snowing. Many folks make the journey to the junction, yet never press on to climb Porter. Surely, some don't realize its proximity or its beauty and I am sure that many a pilgrim are tired after making the sojourn. 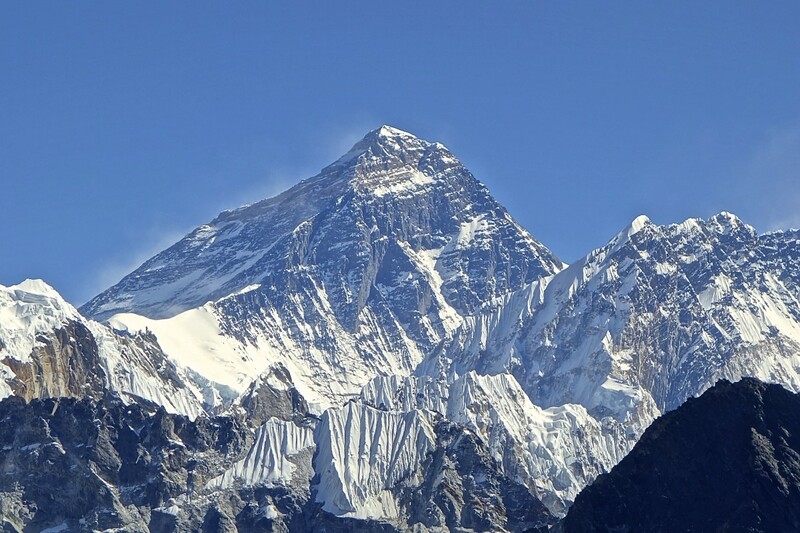 However, Porter is a peak to climb in its own right. Perhaps I don't have the greatest sense of balance, but I have poor luck descending slides. Yes, I can climb up them all day with no problems, but once I start to go down - I go down. 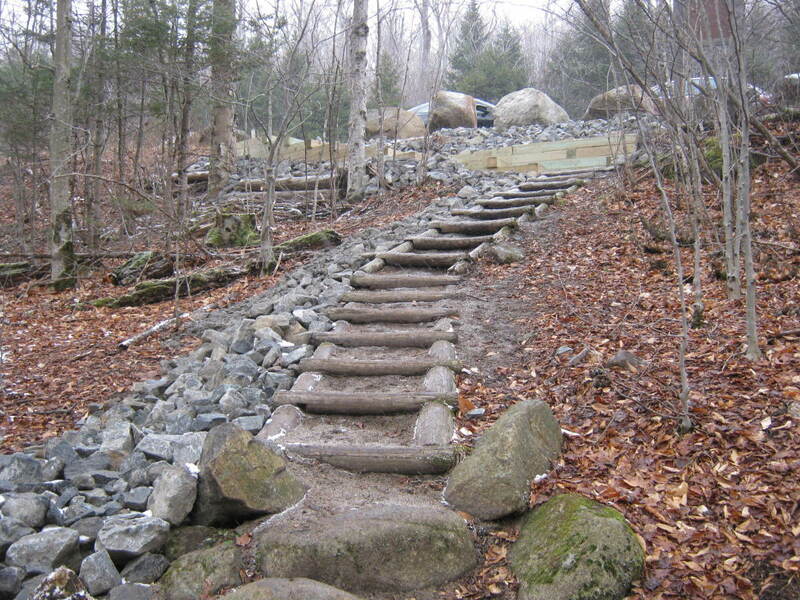 Generally if I have the choice, I like climbing up a slide and descending a more gentle trail. It is surely more gentle on my knees, elbows, and tailbone. Though the descent down the slide wouldn't be too bad, I didn't relish the idea of bushwhacking through the tangle of spruces again. 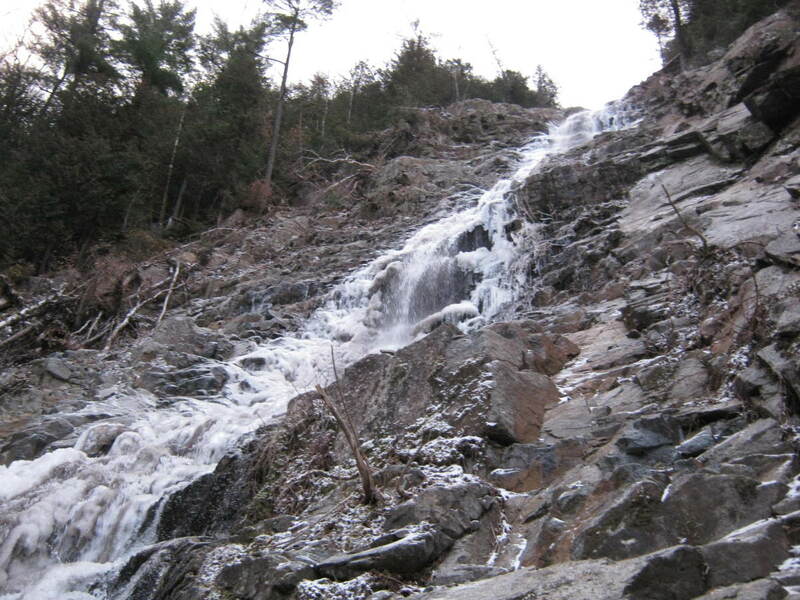 So, after climbing Porter, I headed down the regular cascade trail . Along the way down I met four pairs of hikers that were climbing Cascade that day. 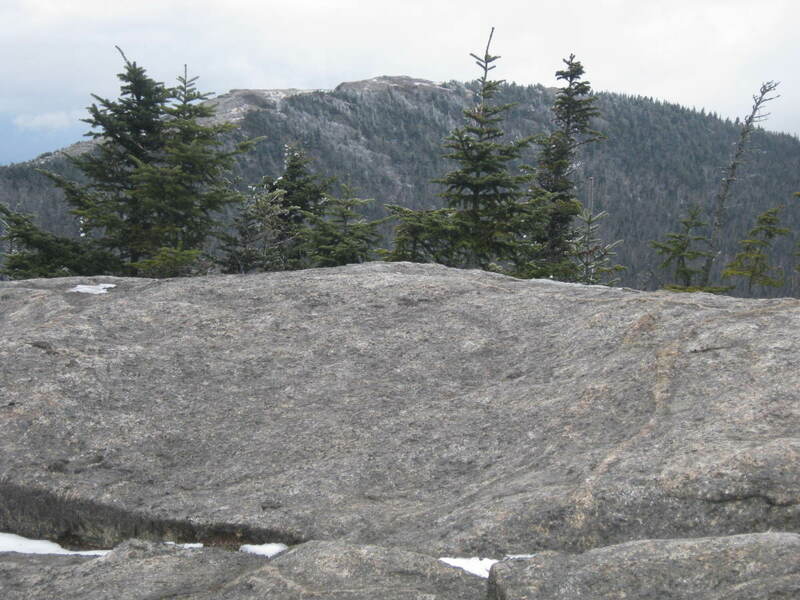 For some, it was their first time on the mountain, and for one it was to be their first Adirondack High Peak. I am hope they all got the experience they were looking for, I know I did. The snow started coming down harder as I was halfway down the mountain as the snow clouds closed in around the peaks. I made it down the trail to the road quickly and then walked the remaining distance along the road back to my car. 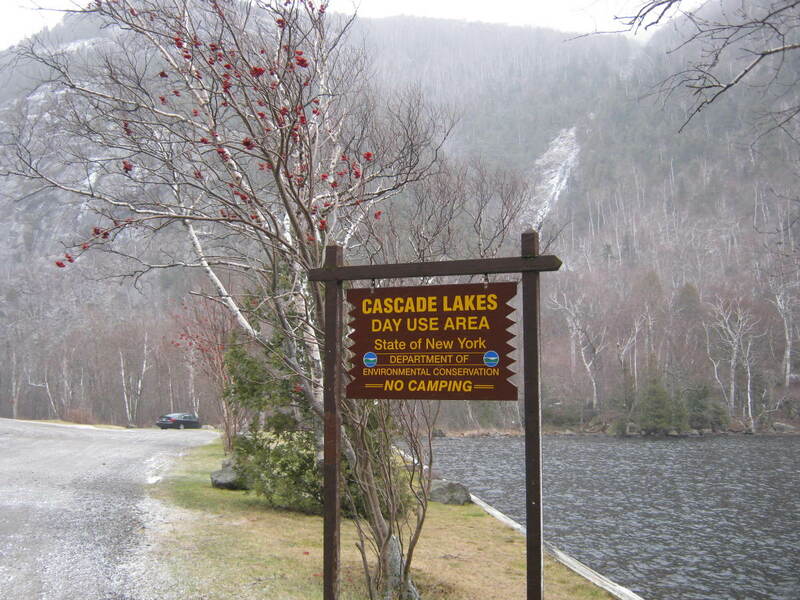 As I walked alongside of Cascade Lake I kept my eye on the new slide and though how amazing it was that I had the honor of climbing it. 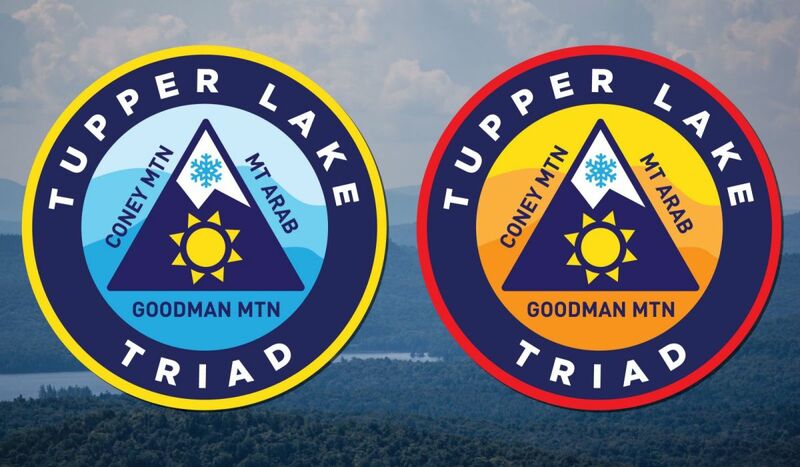 The Adirondack Forty-Sixers are an organization of hikers who have climbed all 46 High Peaks of the Adirondack Mountains.